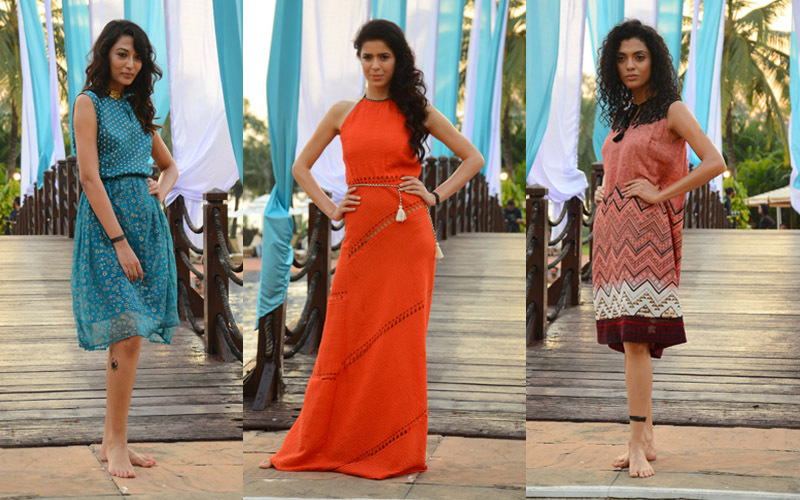 The three day fashion extravaganza that was Season 2 of Gionee India Beach Fashion Week 2015, powered by Roposo, with Abraxas Lifestyle as the media partner, recently came to a glittering conclusion at The Lalit Golf & Spa Resort in South Goa. 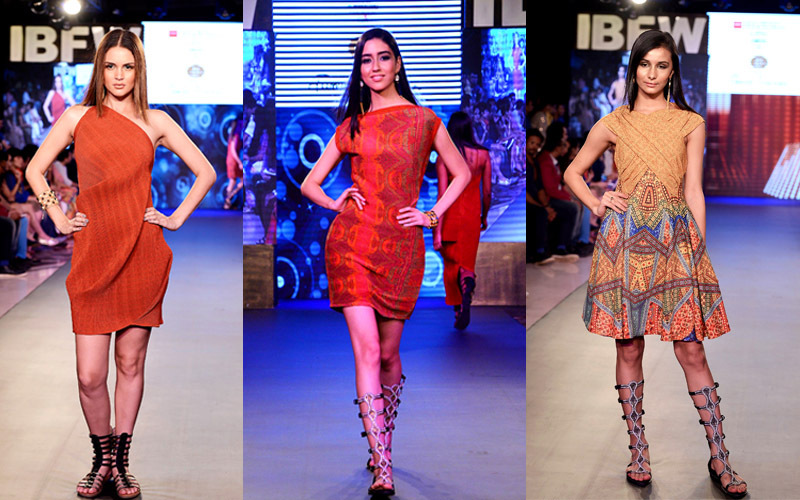 Abraxas Lifestyle presents to you glimpses from the blockbuster event straight from the runway. 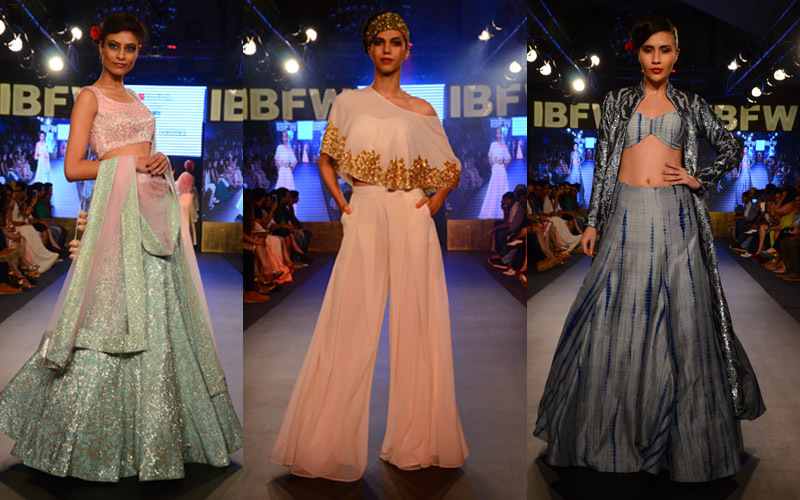 Titled “Byzindiantyne” and inspired by Paul Bhosale’s iconic Christian art, James Ferreira’s collection featured a stunning line of ghagras, saris, kurtas, jackets, trousers and shirts. The menswear segment showcased ten crisply tailored garments; sheer black and white muscle sleeve tunics were teamed with piped track pants, and blousons with shorts. Sensuous sheaths, pleats and prints with a new dimension on fabrics like raw silk, viscose, cotton, georgette and heavy crêpe. Drawstring cowl pants in mustard ideal for beach soirees. Titled “Coupe Mélange”, the collection was inspired by the Avant era and featured an exclusive line of futuristic bikinis and zombie themed bridal wear influenced by Gothic tones. The collection included gorgeous lehengas woven with ornate jackets, corsets, and bustiers while the men’s wedding line featured cowls, Jodhpurs and dhoti pants teamed with jackets, bandhgalas and sherwanis. The women’s beachwear line featured tasselled, fringed, and frilled bikinis, embellished with cones, appliques, sequins and baubles on fabrics like taffeta, lycra and satin. Exotic weaves and texturing on lehengas and use of traditional Nari work and zardosi on luxurious fabrics like brocade and silk, along with tulle, taffeta and neoprene blended beautifully with leatherettes. Complementing the dark and striking look of the entire ensemble, black eye-shadow and dark lips that perfectly highlighted the models’ wild, unruly hairdos. Titled “Life”, the designer’s menswear collection showcased sherwanis and bandhgala jackets in black with heavy embellishments as well as capris in neutral hues and vivid suits in a kaleidoscope of orange, red, acid green pink and maroon. 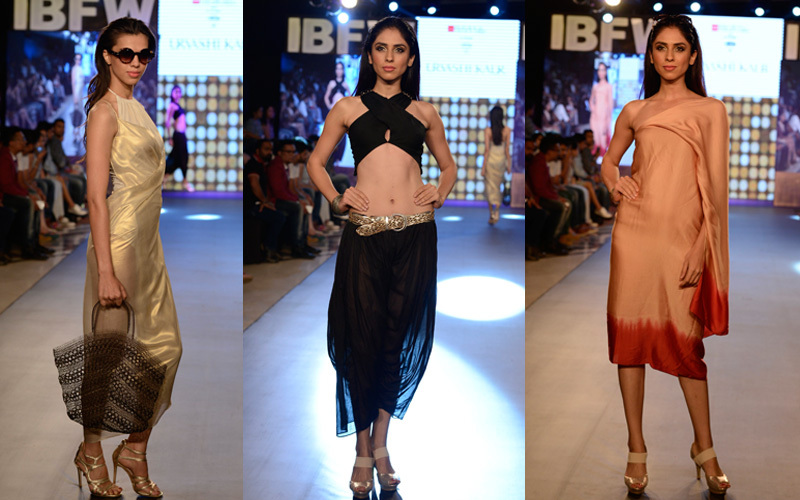 The women’s collection featured bikinis in a mélange of colours, splashed with embroidery and embellishments. 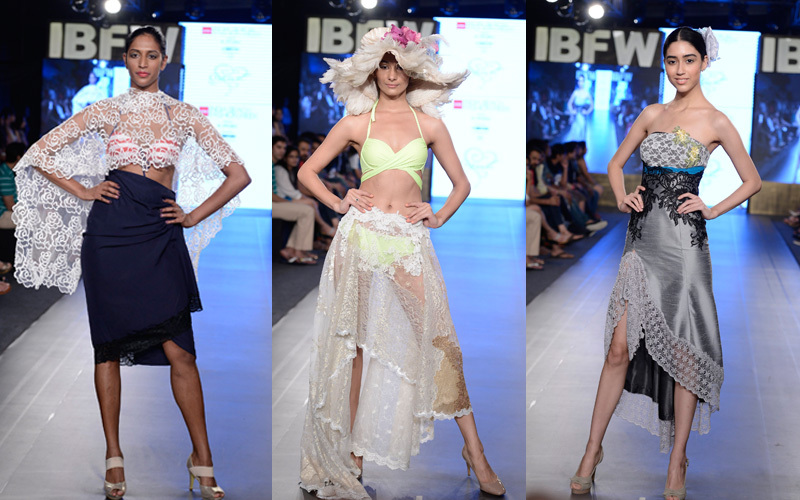 A stunning bikini line-up by ten models on the poolside bridge, paired with sheer covers, ponchos and tasselled capes. Titled ‘Destination Brides’, the collection was inspired by the 50’s and featured capes, lehengas and saris for all the festive occasions surrounding the ceremony, as well as effortless, feminine sequinned pants. The menswear line featured shirt-kurtas, black-and-white batik sherwanis, sequinned bandhgalas and glittering fully-embroidered black sherwanis. Weaving together threads with fine designs work, and chic and contemporary silhouettes that are easy to pack, travel with and wear around. Actress Richa Chadda’s deep-red lehenga dazzling with a heavily sequinned hem, and paired with a backless glittering choli and tulle dupatta. Titled “The Journey” and inspired by the 1960s revolution and the spirit of the hippy culture, the line in cool cotton and khadi featured ankle-length trousers, piped pockets on the jackets, printed black and white pants, kurtas with leaf prints and checked suits. The women’s wear line comprised of gowns, lace covers over miniskirts and long maxis with sheer prints. Simple monochromes formed the basis of the collection with earthy and watery hues of blue and beige being the primary colours. Florals and foliage were the major motifs along with the Bob Marley bohemian typography. Tie-and-dye checks further added to the print card to create a mélange of exciting options for men’s wear. Titled “The Black Dove”, jewellery designer Mona Shroff showcased a line of Resort Beach jewellery (handcrafted in The Philippines) featuring pendants in geometric shapes clasped together with rows of beads or strands of leather. Wrist cuffs and stone bracelets matched the colours of the necklaces. 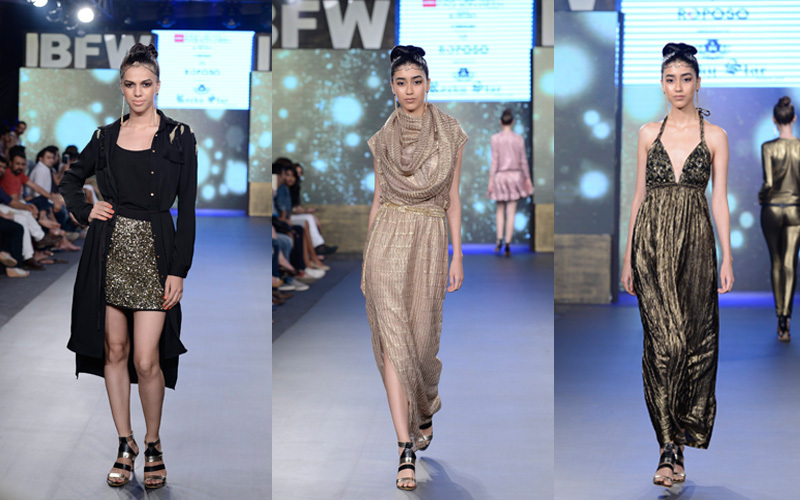 Jewellery Designer Moni Agarwal showcased the ‘Zohrakshi’ line, inspired by nature’s beautiful flowers. Intricate floral inspirations were part of the neckwear that Moni created into scalloped creations and finely designed pieces. 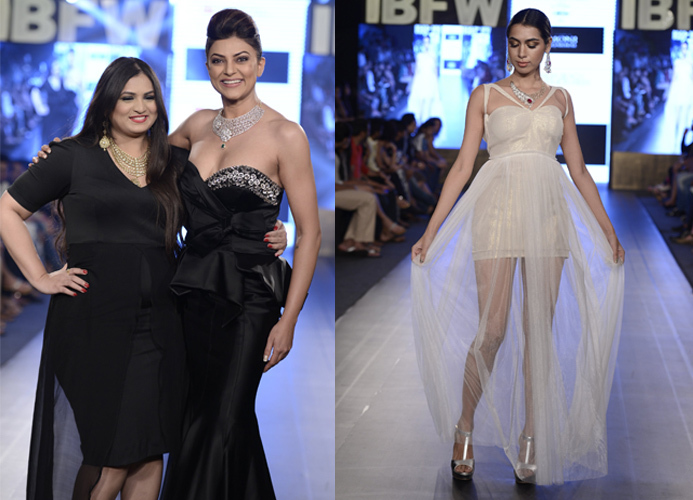 The very interesting white garments that matched the jewellery were by designer Pramita Shetty. There were collars with rows of diamonds while tiny white spheres and florets were part of chokers edged with pearls. Adding more drama to the jewellery were earrings that balanced the ornaments. A poolside presentation of her collection titled “Bohemian Beach Bell” featured swimwear with sarongs, kaftans, capes, trendy kurtas and swirling gypsy skirts in vibrant colours while the menswear collection featured kurtas, soft shirts with capris or Bermudas, off-white tunics, cropped pants and white kurtas. The collection featured gold and silver stretch pants, antique gold halter gowns, taupe dresses, sequinned shorts with lace bustiers and tulle capes, as well as sequinned neckties and khaki tunics with faux leather pants. Silhouettes moved from fluid to sensually figure-hugging lines, in a colour story of rich, languid and regal hues. Inspired by Grecian classicism and Indian heritage, the collection boasted of burnished bronze and gold toga dresses interspersed with separates and swimwear including halter bikini tops, asymmetric cascades and sensuous monokinis. Black dhoti pants with an encrusted belt paired with a wrap around crop top with studded straps. Gionee India Beach Fashion Week, owned and conceptualised by UVAR Global, today stands as Asia’s largest and most stylish fashion concept for beach, resort and cruise wear. The event also introduces the concept of bridal wear dedicated to the destination wedding market. Gionee India Beach Fashion Week Season 2 2015 is an exclusive UVAR Global property, powered by Roposo with Shopclues.com as the official e-commerce partner, in partnership with The Lalit Golf & Spa Resort. UVAR Global offers 360-degree brand and business capitalisation for partners and stakeholders. They also use innovative new technology to help business expansion for clients and partners. One of their major aims is to promote budding designers and young talent by providing them a platform to showcase their work. The company is dedicated to creating IPs in the lifestyle sphere and has successfully come up with concepts like the Indian Resort Fashion Week, FTV Play, Style Party, and Gold’s Fit & Fab, among other properties. UVAR Global has several branch offices across Mumbai, Pune and Goa.